معیشت کشاورزان متأثر از ‌مقدار دارایی‌ها و تعادل بین این دارایی‌هاست. هدف این تحقیق توصیفی- پیمایشی، تحلیل سطوح دارایی‌های پایداری نظام شالیکاری شهرستان رشت است. جامعة آماری تحقیق شامل همة شالیکاران شهرستان رشت (84772N=) در سال 1392 بود که حجم نمونه با استفاده از جدول حداقل حجم نمونة کرجی- مورگان و با روش نمونه‌گیری خوشه‌ای متناسب با حجم جامعه (401n=) انتخاب شد. 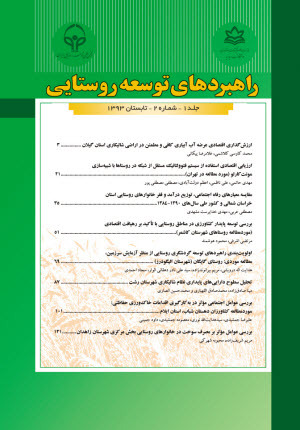 ابزار تحقیق شامل پرسش‌نامه‌ای طراحی‌شده با 42 گویه و 13 مؤلفه برای پنج سرمایة معیشت پایدار (فیزیکی، انسانی، اجتماعی، مالی و طبیعی) است که روایی صوری و محتوایی آن با نظر اصلاحی متخصصان و کارشناسان تأیید شد. یافته‌ها نشان داد که سرمایة انسانی در شهرستان رشت از بیشترین سطح در میان پنج سرمایة پایداری برخوردار است. همچنین به ترتیب سرمایه‌های فیزیکی، اجتماعی، مالی و طبیعی در سطوح بعدی قرارگرفته‌اند. شاخص ترکیبی کل برای پنج سرمایة فیزیکی، انسانی، مالی، اجتماعی و طبیعی به ترتیب 03/1، 361/1، 866/0 و 8/0 محاسبه شد که بیانگر این است که با بهبود و ارتقاء سرمایه‌های موجود در روستاها و در بین شالیکاران می‌توان به پایداری کشت برنج در شهرستان رشت کمک کرد. Access and use of sustainable asset can improve farmer economics status and farmers livelihood affected by capitals quantity and balance between these capitals. The main purpose of this descriptive-conductive research was to analysis sustainability asset in paddy systems of Rasht city. Statistical population of this research contained of all paddy farmers of Rasht township in 1392 (N= 84772), where sample size determines by Krejcie and Morgan sample size (n= 401). The questionnaire included 42 indicators and 13 components for five sustainable livelihoods capitals (physical, human, social, financial and natural). Content and face validity of research tool was obtained by a panel of experts. In order to obtain reliability of questionnaire, Coder- Richardson was used (0.96). The results show that human capital has highest level among five sustainable capitals. Physical capital, social capital, financial capital and natural capital ranked in order. Total component indicators for physical, human, financial, social and natural capitals calculated 1.03, 1.361, 0.866 and 0.8, respectively. This results show that improve in current capitals of rural areas would help to sustainability of paddy cultivation systems. آمارنامه جهاد کشاورزی استان گیلان (1390). آمارنامه کشاورزی (1386- 1387). وزارت جهاد کشاورزی، معاونت امور برنامه­ریزی و اقتصادی، دفتر آمار و فناوری اطلاعات. آمارنامه کشاورزی (1387- 1388). وزارت جهاد کشاورزی، معاونت امور برنامه­ریزی و اقتصادی، دفتر آمار و فناوری اطلاعات. آمارنامه کشاورزی (1388- 1389). وزارت جهاد کشاورزی، معاونت امور برنامه­ریزی و اقتصادی، دفتر آمار و فناوری اطلاعات. کلانتری خ (1380). برنامه­ریزی و توسعه منطقه­ای (تئوری و تکنیک­ها). چاپ اول. انتشارات خوشبین. Barrera-Mosquera V., de los Rios-Carmenado I., Cruz-Collaguazo E. and Coronel-Becerra J (2010) Analysis of available capitals in agricultural systems in rural communities: the case of Saraguro, Ecuador. Agricultural Research. 8: 1191-1207. DFID (2000) Sustainable ivelihoods guidance sheets. Departmentfor International Development. London, UK. Ellis F (2000) Rural livelihoods and diversity in developing countries. Oxford University Press. UK. Fang S. and HaiYang S. H (2012) Relationship analysis between livelihood assets and livelihood strategies: A Heihe River Basin Example. Sciences in Cold and Arid Regions. 4: 0265-0274. Goodwin N. R (2003) Five kinds of capital: useful concepts for sustainable development. global development and environment institute.Working paper No. 03-07. Hassanshahi H., Irvani H., Kalantari K. h. and Rezaee A (2008) Analysis of capital assets of natural resources management system in the agricultural production cooperatives (APCs) in fars province, Iran. Sustainable Agriculture. 2: 150-157. Khalfan M. A (2002) Sustainable development and sustainable construction. A Literature Review for C-Sand. Working Paper 1. Parmawati R., Soemarn o., Nugroho I. and Setiawan B (2012) Level of sustainable livelihood approach at central agriculture city of batu. Basic and Applied Scientific Research. 2: 5631-5635. Scoones I (1998) Sustainable rural livelihoods: A framework for analysis. Instituteof Development. Working paper. 72 - 112. Woodhouse P., Howlett D. and Rigby D (2000) sustainability indicators for natural resourcemanagement & policy,a framework for research on sustainability indicators foragriculture and rural livelihoods. Working Paper 2, February 2000. ISBN: 1 902518624, Department for International Development Research Project No. R7076CA.